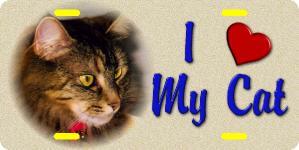 "Vanity License Plates featuring Cats"
Our full-color License Plates are made of non-rusting, heavy gauge .025" aluminum and fade resistant for up to 5 years! Laminated for extra protection against UV, bugs, pebbles and scratches! Now also available in Engineering Grade Reflective material, like those used by Law Enforcement, and Fire/Rescue vehicles! Do you want to create your own license plate? Using materials that you already have but need a blank license plate to bring your ideas into fruition? 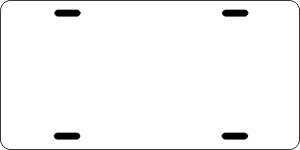 Order this standard sized license plate blank (6" x 12") and let your creativity and imagination soar. Apply designs using stickers, paints, whatever you can think of. Happy Creating! 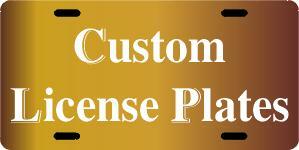 Visit our Custom Designs page for general information about ordering license plates with your custom designs. Also read our FAQ on image requirements with regards to resolution, size and other matters.